With less than a month to go before Election Day, not all American voters are aware of their states’ voter ID requirements. A new national survey finds that the confusion runs two ways: Some voters live in states that do not require identification to vote but think it is needed, while others living in states that do require IDs mistakenly believe they do not need one to vote. About four-in-ten voters (37%) living in states with no identification requirement incorrectly believe that they will be required to show identification prior to voting, according to a survey conducted Sept. 27 to Oct. 10 among 3,616 registered voters on Pew Research Center’s nationally representative American Trends Panel. 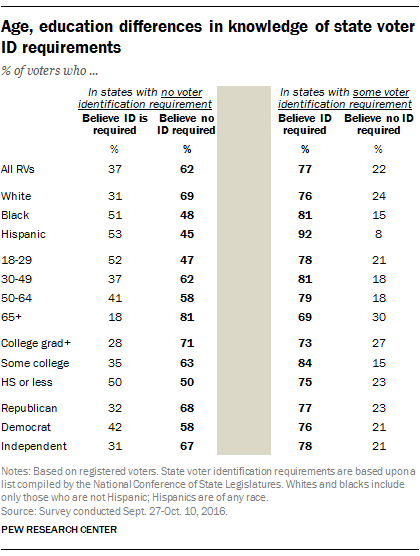 About six-in-ten (62%) in these states know they do not have to produce a photo ID to vote. In the states that do require or request identification, more than three-quarters (77%) of voters know it is needed. 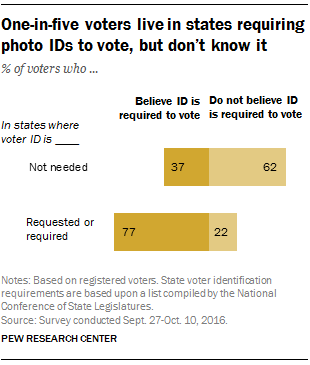 However, about one-in-five voters (22%) in these states do not know a photo ID is needed, which may result in inconvenience or could prevent them from voting at all. The National Conference of State Legislatures classifies voter identification laws into three broad categories: There are 18 states plus the District of Columbia that have no identification requirement. Another 22 states “request” identification but provide conditions that permit voters without it to cast a ballot with no additional action on the part of the voter to affirm identity (e.g., voting by provisional ballot, or signing an affidavit of identity). The remaining 10 states have “strict” identification requirements. In these “strict” states, voters who cast provisional ballots must take additional steps after voting to affirm their identity before their vote can be counted (e.g., a voter may return to an election office with an acceptable ID). In states that do not require IDs to vote, blacks and Hispanics are more likely than whites to mistakenly think they do require an ID. Overall, about half of black (51%) and Hispanic voters (53%) in these states incorrectly believe they will need to show identification. 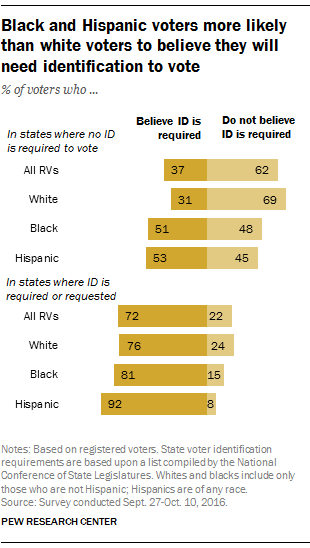 By contrast, only 31% of white voters living in states with no voter identification requirement incorrectly believe that they will have to show an ID in order to vote. However, about a quarter of whites (24%) in states with a voter identification requirement incorrectly say they do not need an ID to vote. That compares with 15% of black and 8% of Hispanic voters in those states. There are wide age and educational differences in knowledge of voter ID requirements in states with no requirements. Young people and less-educated adults are more likely than older and better-educated people to say incorrectly that an ID is required to vote. But there are more modest differences in awareness in states that do require voter identification to vote. Note: See methodology and topline from the Sept. 27-Oct. 10 survey.